So awhile back, when I did my post on which characters I identify with in fiction, mythbri pointed me towards the Myers-Briggs Type Indicator, a personality test based upon some of the research of Carl Jung on people's thought processing and attitudes. I had never heard of the test before but upon their suggestion I decided to take it. I've taken the test now several times and although my results do occasionally vary, I almost always come up as an INFJ. What Characters Do You Identify with? The test is built around four basic indicators of personality type: introversion vs. extroversion, intuition vs. sensing, thinking vs. feeling, and judgment vs. perception. While it's not a perfect measure of every variable that goes into a person's personality, I feel that it is very informative and looking at some of the personality descriptions in more detail I believe it has a lot of utility, even if it is often misused within a professional context. Looking inward at myself as an INFJ has helped me realize some things about myself as well as to come to terms with some characteristics I've had issue with in the past, while also recognizing my own strengths. 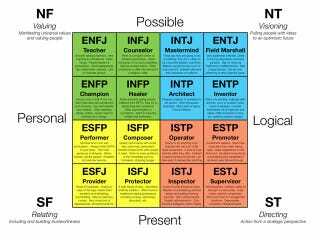 If nothing else, I feel the MBTI is a useful introspective tool. INFJs are described as the rarest of all personality types, though they're not so exceptional as to be unheard of and if you dig deep enough, we pop up in a lot of places you might not have expected. We often go unrecognized though, because the specific combination of our functions makes us a bit unusual. We're feelers but because we're introverts we're fairly uncomfortable discussing those feelings publicly and instead project what sometimes appears to be a cool and stoic exterior. We're introverts but we crave the admiration and attention of others and so are often described as social blenders, who adopt the characteristics of those around us in order to form bonds and attachments. We're judgers but because our judgment function is turned inwards and coupled with our intuitive function we often appear disorganized or scatter-brained externally, even though internally we love to sort things into patterns and systems. As a consequence of all these seeming contradictions, INFJs are often stereotyped as exceptionally complex and deep. I don't think that's really true myself - I believe most people are complex when you really dig deep - but our unusual nature makes us appear complex, since we're manifesting our functions in ways that most people don't and it's very easy to mistake rarity for sophistication or depth. Pictured here are several people - both real and fictional - who are frequently typed as INFJ. I intentionally included both the good and the bad in the mix, because I believe every person has the potential for great virtue as well as great evil. A lot of people may feel uncomfortable sorting Gandhi and Hitler into the same personality type, but I actually feel the asymmetry is a strength of the typing; I'd be much more skeptical of the test's accuracy if one personality type consistently came out as a "good" personality and another as "evil," because I believe it's what you do that determines your morality and less what you think or believe. The more you read about Hitler the more it becomes clear he was a deeply sentimental and affectionate person, which makes the suffering he caused and the hatred he espoused all the more remarkable, an observation I made long before learning he was an INFJ. When it comes down to it, INFJs are passionate, deep thinkers with a strong desire to connect with others on an intimate level. We're romantic dreamers who struggle with our dual desires to do what's right as well as to earn the affections of others. We love to sort things into patterns and organize the world in a way that makes sense of it, but often do so in a way that pulls us out of the world we want so much to be a part of. Like everyone else, we're full of contradictions. So... have you taken the test? And if so, who are you?